Looking to make good on your New Year’s resolution to exercise more? 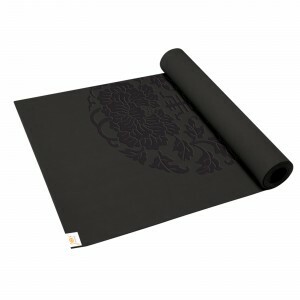 This amazing Dry Grip Yoga Mat from Gaiam may be just the thing you need to get you motivated! Get deeper into your posture during a hot yoga practice when you’re slip- and worry-free on Gaiam’s Sol Dry Grip Yoga Mat from Gaiam’s premium line of yoga mats created for yogis, by yogis. This mat is created with a topcoat that promises to wick away moisture and provide better grip as temperatures in class rise. Constructed from a “closed-cell” material, this mat seals out germs, odors, and bacteria. Manufactured free of the top six most harmful phthalates, this mat is a healthy choice for both you and the planet. 1. Sign up for our free e-newsletter (no spam ever). 2. “Like” Appetite For Health on Facebook. 3. Leave us a comment below telling us how you plan to get fit in 2015. All AFH Terms and Conditions Apply. Entries will be accepted until midnight January 12th, EST. I’m finally integrating yoga into my marathon training. This year I hope to qualify for Boston. I am finally integrating yoga into my marathon training. I hope it helps get me to Boston. I plan to incorporate yoga into my weekly workout routine at least 3 times per week. I love the sense of serenity from yoga, and it allows me to stretch out my muscles more than other forms of exercise that I do. I never regret making it to my mat. I had a total knee replacement for New Years ans now have to find different ways to stay fit. I will continue to do yoga as part of my fitness routine. Plan to get fit by stepping up my yoga. Recently moved and with all the chaos, I didn’t find the time for yoga on a regular basis. I am signing up for classes and will find the time in spite of renovation projects. I have Liked Appetite for Health. I plan on getting fit by doing Zumba with my daughter. Training for the Spartan race with my bf! Increasing my cardio, everything else is on track, the strength training, flexibility and stretching, and the nutrition = good. I am going to start doing squats and lunges again daily. More biking and yoga is how I plan to stay fit for 2015! Thanks for the chance to win! which also includes one run a week and one yoga class a week. Running, running and more running! I’m see excited about the website Appetitie for Health. I will be sharing articles often!! Eating better and I plan to exercise more too. I’ve been drinking water more often. By making smarter food choices and committing to getting active daily even when I don’t feel like it. Walking, weights and biking.. Yoga classes. I want to start doing spinning and yoga this year. Have been lax about doing yoga and intend to get back to it. I have signed up for newsletter. I have Liked Appetite For Health on Facebook. I would like to get fit by walking more. I am a long time follower of AFH. I referred a friend to your giveaway and tagger her on your page. I had a baby this last year (July 2014). I lost the baby weight really fast and someone put on 25 pounds afterwards? What happened? I want to train for a PR half marathon. I haven’t run one in three years and it’s time to lose weight. I’d LOVE this mat for stretching and I have a workout video (yoga booty ballet) that I need a mat for, thanks for considering me and for all your advice and tips. You two help us out so much! I just started trying new classes. I like the barre one! I have some back issues, so the mat would be perfect for me to do some stretching at home! We’re going to try adding new foods into our regular diet, like guava. I plan on continuing what I started in 2014. I will continue to run, but will add more miles to my year. I want to try yoga as well. I plan on getting fit this year by adding more whole grains, fruits & veggies and protein to my diet along with exercise and drinking more water. I plan to enlist the help of a workout buddy, use a phone app to track my fitness goals and nutrition. I also am signing up for a gym membership. We are eating less and exercising more in 2015. Mira S, Trisha B, Joan G. — Congrats! You are our winners!